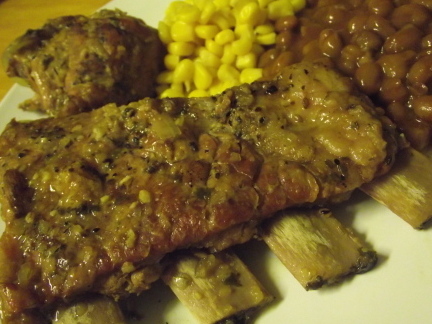 These are semi-slow cooked pork ribs so be prepared to wait. Trust me when I say that these are more than worth the wait. Whether you like your ribs juicy & dripping or dry and flavor packed- this is your recipe! To change up the flavors I sometimes substitute the apples with plumbs, apricots, or cherries. Put everything in a big food processor (other than the ribs, obviously) and blend it until it’s chunky/semi smooth. Take the ribs and over a hot grill char them on both sides (about 2 minutes each side). Dump the delicious mixture into a casserole dish and coat all sides of the ribs. Squish them into the dish and cover with the chopped onion. Bake at 250 for at least 2 hours. If you like “drier” ribs throw them on a hot grill for a minute per side right before serving.